Earlier in the week, I highlighted the next downtown apartment building to open, The Lincoln. Today, I wanted to step back a bit and share some thoughts about the general downtown apartment landscape and the market around them. Here are some quick thoughts on the state of new developments that cater to the rental market. There will probably be many more mid-rise apartment buildings coming. We have plenty of room for them. At the end of the day, we are becoming more urban. The downtown apartment mid-rises that have been built over the last few years seem to have a specific formula to them. There are several hundred units wrapped around a parking deck and courtyard. If you add in amenities like a gym, pool, and lounge then you can now, most likely, make a profit providing rental housing. This isn’t specific to downtown however. Apartment complexes all over the city apply the same formula. The difference is in the built environment. For example, a 200+ apartment complex in North Raleigh may be spread among several buildings (3 or 4 stories) surrounded by surface parking and all the amenities built into a clubhouse. It’s built this way because it is most likely cheaper and purchasing the available land to accommodate this is cheaper compared to downtown land. Projects are more compact in downtown because of this. Nothing terribly new or shocking here but to me, it sounds similar to another development model. Cheap land and a very large footprint is the model behind the big-box retail store. Lots of inventory under one roof and cheap surface parking further keep costs down. This is why there are no big-box stores in downtown, the environment doesn’t fit to the model. So how are “big-box apartment” projects cropping up? My thoughts start out with the fact that downtown land is expensive but not expensive enough for these projects. If a nice square or rectangle plot can be acquired (a less complex building is cheaper most likely) then a several hundred-unit building can be profitable. You also have to consider construction materials. I’ll let any engineers chime in but from what I understand it to be, there’s a threshold around the 6 or 7 story limits of a building. Higher than that, steel construction has to be used and therefore is far more expensive. If you can stay under that threshold and build with wood, then the project is viable. Find some underutilized land that forms a square/rectangle. The less structures already there, the better. In under 6 stories, can you fit several hundred units, a parking deck, a courtyard, and some amenities? The point I want to make here is that between all four corners of downtown, there is a lot of available land to play with. A plethora of surface parking lots that are more valuable than they seem are waiting to be built on. I’m not an expert on the economics here but it really feels like we’ll be seeing many more mid-rises in coming years. 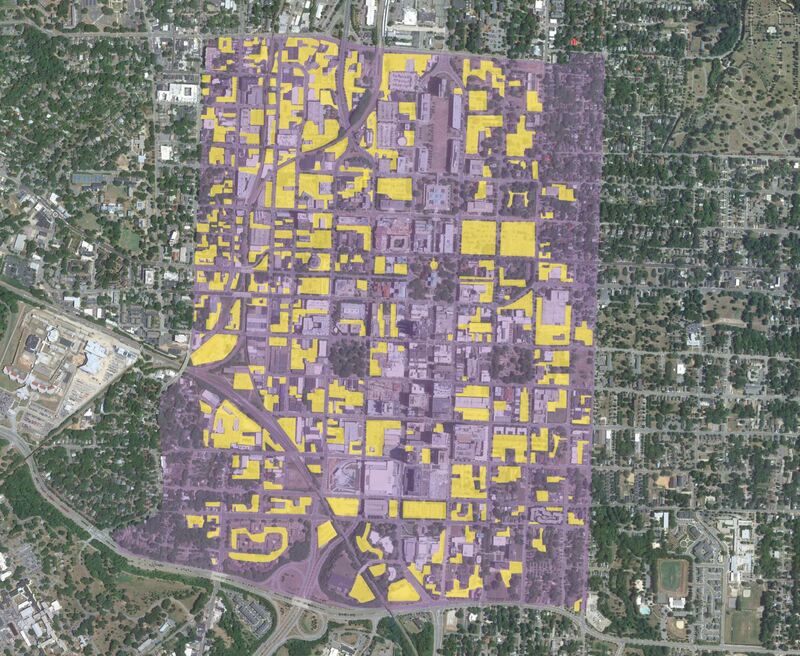 Just take a look at all the available surface parking in downtown Raleigh in the graphic below. Click for larger. Yellow indicates surface parking in downtown Raleigh. Data is dated 2011. The graphic is a few years old and only a few lots need to be changed but it still makes my point. We have lots of room to grow within. As far as affordability goes, there is definitely a premium to pay with these new apartments only because they are located in downtown Raleigh. The supply is trying to catch up with demand so right now, the prices are high. (compared to the rest of the city) This seems to happen in other industries also. Prices drop when things have been out for awhile and access is easier. What people are forgetting is that before 2005, maybe even later, renting in downtown Raleigh was an extreme niche. There were only a few hundred units (if that) spread across random buildings and in small clusters. We essentially had a seedling of a rental community at the time. Then, downtown living become a thing real fast and developers are trying to meet that demand. In the grand scheme of things, everything is still so early. The prices should fall once supply increases and some of the first units to come out start being dated. If you are a fan of Jane Jacobs then you should believe that to create affordability, you want a mix of housing with a mix of ages. New apartment buildings can command high prices because they are new, have the latest amenities, and styles. Buildings that have a few years on them, may be a little dated but are perfectly fine places to live and priced a little less. Buildings older than that may be even cheaper because they only have one of something or don’t have such and such amenity. You get the picture. It takes time which is tough for some to realize and puts downtown Raleigh in a awkward position because all this rental housing is really just starting to be built. We don’t have that history and those range of options like the rest of the city has. Still, I don’t think it should surprise anyone that the development will keep coming (my prediction anyway) until land prices increase or market preferences change. I say we continue to cheer on these developments because what we really want is a vibrant residential community with a variety of living options. We also need some of that available land to be built on so that newer project have to be more creative. I don’t feel like these mid-rise projects, with their “big-box” footprints and lack of design, are that urban in nature. However, what they are doing is moving Raleigh up just a few more notches on the urban scale. I believe a few less car trips will be taken by these residents and that is the path we must take as we approach a true urban center in the future. It’s transitional and reflective of the current market preferences and political climate that we live in today. I’d love to keep this conversation going with anyone who has insight on topics like this. That was a very well-written and insightful piece. It gives us a lot to think about. Overall I’m not super impressed with a lot of the 6-story apartments being built. However, it is far better than the nothing that they usually replace. It’s also an interesting point about the “affordable housing” which is constantly mentioned. With only a few exceptions, these low-rise apartment buildings contribute a lot to the existing fabric of our city. Their form is far more urban than most crap that was built in the [recent] past, so I will cheer and remain optimistic. The thing that scares me is these projects finding their way into the city’s core (i.e. Edison Apts), but there is a lot of undeveloped land in areas like Glenwood South and Eastern Downtown, which is also cheaper to acquire. Hopefully, developers will keep these low-rise projects there. Your article was right on the money. Well done, Leo!!! We have to start somewhere. I would like to see more impressive projects come along just as much as anyone else but those projects need demand and these 6 story projects put feet on the streets. The condo at Peace and St. Mary’s along with the Victorian Style Condo across from Boylan are more attractive and they likely cost more. The reality is that outside of the Fayetteville St area for every 6 story building there is still ten 1-2 story buildings. So downtown is getting taller and more dense. We see that the county is starting to build taller with the Justice building and the State went taller with SECU building. So hopefully our municipalities continue to think big. Corporate growth downtown is what would truly produce better projects. I believe the multifamily cycle has peaked in Raleigh and is on the back side and slowing down. Beyond the Greyhound site, there may be a few more of these projects announced, but in tracking the leasing of Skyhouse, the absorption of those units has slowed, and it appears to be still 40% vacant. As more units come on line, the rent rates will need to come down due to supply/demand which will then lower returns and reduce the investment money being pumped into multifamily. One of the reasons for these big box projects is that it’s easy to assemble entire blocks in downtown Raleigh. And as you stated, spreading out (to fill an entire block) is cheaper than spreading up vertically. This allows for cheaper wood construction plus improves the yield of the project given the larger footprint (vs simply a smaller portion of the lot being developed) – maximize profits while minimizing costs. Thanks for this conversation Leo. I think it’s good to keep a perspective on these issues. No city can jump development cycles and Raleigh is still in its infancy regarding development. To the article, I have a few comments and one request. 1. Buildings taller than wood construction supports can be either steel or concrete construction. I’d put my money on concrete before steel. 2. I am not a fan of the “style” of a lot of these new apartments and I think that the designs are often ordinary and formulaic. That said, style alone doesn’t make something urban or not. To make them relevant to the urban fabric, they need to engage the sidewalk in a public way. As long as the new apartments have sidewalk storefront space in them, they are urban. The problem is that some of these new apartments don’t have such space; Elan is a good example of this problem. This is not to say that every single building built downtown must have storefront but we need at least a good proportion of it to have it. 3. 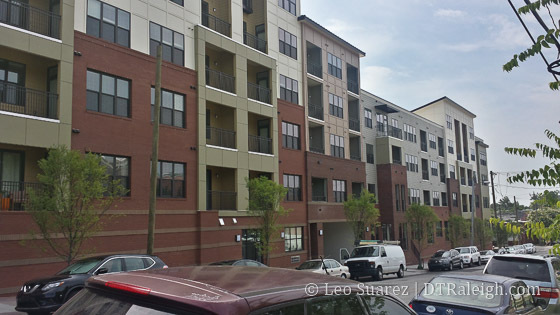 I completely agree that Raleigh is ripe with opportunity to develop more urban infill. I don’t think that it’s just about surface lots but also about the under utilization of currently developed land in the DT Boundary. Of course, there are many historic properties that I am not suggesting we raze but there are many other properties that are neither interesting nor historical and can be redeveloped. Many of these properties are sitting in their own miniature sea of surface parking. 4. Why or why can’t a retail project be built using the current apartment model? Of course, this sort of thing can’t be in wood. That said, a retail project that had a destination anchor or two (Apple Store, Crate and Barrel, Multiscreen Cinema, etc.) can be built similarly with sidewalk retail, big box retailers and even a courtyard for urban alfresco dining or even evening “skybar” type lounge experiences that wouldn’t bother sleeping residents in other buildings. 5. Regarding the map of surface lots available, I have a request. If the map is going to go a few blocks deep into single family homes to the east, can it at least go to St. Mary’s Street on the west side? The block between Boylan and St. Mary’s is clearly within the boundary of the Glenwood South neighborhood and important to the urbanization of DT Raleigh. The key to affordable housing is density. I personally really like the urban cottage concept as is being built over at Dorothea Gardens. The average density of neighborhoods adjacent to downtown is only 6 units per acre. With proper design urban cottages can be built at 14-20 units per acre while still maintaining correct proportions, massing, and traditional streetscape elements (according to what I’ve read). I don’t think the UDO allows density to be this high with R-10 about as dense as it gets I think. As land prices continue to increase developments such as Dorothea Gardens seems like a great way to keep housing more affordable. Search on “Urban Cottage Raleigh” for details. I’m not opposed to backyard cottages either (this was included in the UDO but later removed by City Council after fierce protests from the NIMBYs). The Raleigh Public Record has a great article on the issue. Hopefully backyard cottages will be revisited by the council sooner rather than later. What gets me is the power lines. Several new buildings have gone up and the power lines have stayed. They’re about 10 feet from the building maybe. Then they are planting trees in the sidewalks that are only a foot lower than the power lines upon them planting the tree, which means the tree will grow into the power line by next spring. You can see what I’m talking about in this picture Leo posted. Why is the city not encouraging the reduction of these eye sore power lines? Major League Soccer–yes, I’m changing to discussion. Our napoleonic complex suffering neighbors to the southwest now thinks they should get an MLS franchise.because all of a sudden “soccer is cool”. Where in the hell is Raleigh’s business leaders on building a stadium downtown to support an MLS franchise? Maybe if they start the momentum, we can find an owner(s) willing to pony up the franchise fees which are very cheap by pro sports standards. Why is my changing the subject completely relevant? Because downtown needs a stadium/sports complex NOW!!!!! Bob, I know right? I totally ruins the look of the building to me. Hopefully they will bury the lines when they redo the second portion of Hillsborough street. I think that the power lines is more of a Duke Energy task, not the city’s responsibility (exclusively). Someone might like to confirm this, as I am not 100% sure. Y’all see this?? http://www.newsobserver.com/news/local/counties/wake-county/raleigh-report-blog/article31677923.html – the first out-of-state developer! Jake, Stew mentioned this in another post, but thank you for the link. It is encouraging to see some out-of-state developers being interested in this parcel. Hopefully, their vision will be a great one and they will think bigger than 20 floors. At the least, IF they win, I hope they deliver a high quality product and not something unworthy of this great location. Of course, and some may disagree, a higher buying price may force the developers to think big and not bring yet-another low-rise apartment building. I think we have enough of these. That Texas developer, Aspen Heights, has a 22-story apartment building going up in Austin that looks like it would fit this block well. They also have a 685-ft condo tower going up in Austin. But I can’t imagine something like that working in Raleigh, right now. Land prices downtown are hitting peaks and levels that are becoming too price adverse for apartment developers. Tops for land with zoning for multifamily is $75-$80 a SF. Anything above and developers look elsewhere in Raleigh. I’d have to agree that the mid-rises in the downtown core are problematic. These 5-7 story multi-family buildings are increasing density in a real way but should be left to the ‘outlying areas’. In the future, transit and density will help to reduce parking requirements and perhaps make it easier to go taller. I’m just really curious if the city would say no to someone who bids 4-5 million for that lot if they want to build something say 30 stories? Are any of these large apartment blocks geared toward professionals with children? That is something downtown Raleigh needs. Otherwise young professionals who want a family face the choice of leaving downtown Raleigh or foregoing having children, both tragic decisions for our community. I believe there is a ready market for a family-oriented development with amenities like a large playground in the courtyard, and an on-site day care. This is common in other countries; why not here? William, if that was the proposal, it would just go through the normal rezoning review process. And the actual design would likely be more scrutinized than the height. As it rightly should for something that impactful. Glad the city will have leverage to demand high quality in that case. If this were zoned up to 40 floors like some wanted, then the city (and public) would have much less influence. @Matthew: As a professional with a kid I can say that I would not choose to live in an apartment, especially an overpriced one. Assuming that my finances are stable and I can afford a home, I would look for nothing less than 2500sf, which in downtown translates to houses over $400,000, IF I am lucky. For people like myself, some nice rowhouses and brownstones around $300,000 would be attractive, but this is a market that is truly underserved. The existing townhomes are nothing to write home about, therefore I would not even look at them as options. Downtown Raleigh does not cater to families as much, although it’s not necessarily family-unfriendly. @William: I had this question answered to me recently. If a developer wants to build a 30-story building at 301 Hillsborough, he may do so. No quick approval and 100 rounds of scrutiny is what he will receive, but for a big project it is well worth it. The problem, which causes a lot of confusion to developers, is the city’s wrong choice of words. Mentioning “cap” and “limit” forces developers to look elsewhere. The language is still not clear, and to a certain extend misleading. Now, a smart developer will get the answer to the same question prior to bidding, so I assume someone in the city know if the Texas developer wants to go higher. Personally, I didn’t care about their 22-story building, but a shorter version of The Independent is probably feasible. Probably as a mixed-use building though. FYI, there are plans for a grocery store in Skyhouse called “Skyhouse Grocery” not big but its a start. More like a convenience store than a grocery store. If they are successful then I think it will draw a HT or Trader Joe downtown. BC, thanks for the great news. You are right, IMO. The success of this grocery store may bring a bigger name to downtown in the nearest future, although I would be happy to see several Fresh Market type of stores. Why not A Southern Season returning to its original home: Downtown Raleigh? I know, dare to dream!!! I’m going to say it and everybody can get mad at me and that’s ok. If Harris Teeter, Trader Joe’s, Lowe’s, Publix or some other nice grocery store doesn’t hurry up the end result may be a Wal-Mart Neighborhood Market. Wal-Mart has aggressively been persuing to put these in areas where higher income consumers exist. According to Google there are already a few inside of 540 in Cary and Apex. I know of no rumors to back this though process up. I’m just saying. With all of the condos in the Glenwood Sourh area there should have been a grocer there “yesterday.” Somebody is going to get there first. The Skyhouse store is basically just Taz’s, as I understand it. Still better than nothing, but I still think a Publix makes the most sense. Much better exposure for them in this new market area than fighting with North Raleigh residents who didn’t want it. give out other info. ! I will help him in any way that I can . yes, Taz is making a run at it. What surprised me is that the developer is taking a chance and renting the space for this. There will not be a full size grocery downtown. A smaller one will make it its just got to be the right space at the right spot and the rest will follow. Great piece! Went by these this week they look awesome! Dwight – Appreciate the update on baseball; a downtown ballpark is something that would be perfect for DT Raleigh. Especially with the recent news that CLT is pursuing (and likely favored) for MLS. Who says Charlotte is “favored” for an MLS franchise? It’s one of the smallest markets in America with 2 sports franchises and it clearly can’t support one of those. Charlotte all of a sudden thinks soccer is “cool” and given their napoleoonic complex tendencies, all of of sudden they chase that rainbow. Raleigh has a much larger international population plus the college programs not to mention the largest youth soccer program in the country with CASL. Raleigh just needs a owner to step up to the plate…or pitch in this case. Uncle Jesse , You are not going to believe this! of Capitol Broadcasting Co. , Mr. Goodmon’s right hand man , & he told me that Jim Goodmon is currently trying to bring MLS to Raleigh . Actually , I was hoping that he was calling about downtown Raleigh baseball!